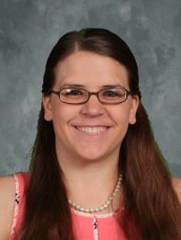 ​I am Mrs. Gehret, I hope from reading this page you can find out more about our Middle School Religion classes and more about me. I'm excited to start my fourth year of teaching! I graduated from Marian University in 2015 with a degree in Religious Education. I have a passion for teaching the beauty of our faith to the youth and to help them along their journey of growing closer to Jesus and building long-lasting, healthy relationships. My husband and I just welcomed our second child, Thomas, at the end of last school year; Maria, our first, is two. Take a look at our classes below! In 6th grade, students learn about the covenants God made with the people of the Old Testament and how we are called to become people of faith. In 8th grade, students learn about Church history, starting with Peter, our first pope and how we are called to spread the Good News in our lives. This year we have a Patron Saint for our classroom! We will be looking into the life of Mary, the Mother of Jesus, the Mother of God, and our Mother. We will be learning prayers asking for her intercession, about her life as Jesus' mother, and how we can ask her to walk with us this school year and always. All middle school students complete acts of service throughout the school year to answer our Gospel call to serve those in need. Every day students in class lead prayer to grow closer to God and to get in the habit of thanking God for our many gifts and praying for those in need.